Needless to say, we are astonished at the irresponsible decision of American Salon Magazine to feature this hazardous product as a winner, as well as advertising it so prominently in their publication. Until the salon industry recognizes just how detrimental the Brazilian Blowout product is, salon workers and clients are still at high risk for a variety of health concerns. As a publication that reaches the masses, American Salon Magazine has a responsibility to uphold consumer safety and awareness. Jennifer and I have submitted letters of protest, as well as Jamie McConnell of Women’s Voices for the Earth, to the editors of the publication, asking that they educate themselves on the hazard, and then address the danger to their readers. It is crucial that American Salon Magazine educate their readers to the dangers of the Brazilian Blowout, as well as all toxic hair straightening treatments. We would love to see this written about it in a future issue. It’s time we in the industry take steps to protect each other, as well as our clients. But we need the help of our readers to get the point across! Please take a moment to submit an email to the editors of American Salon Magazine asking them to address the dangers of the Brazilian Blowout and other toxic hair straightening treatments to their readers in a future issue. Here are the emails to contact the editors: kdonahue@questex.com, labrams@questex.com, jturner@questex.com – a template letter is provide below for you to copy & paste. We thank you for your continued support in our fight to making salons safer! 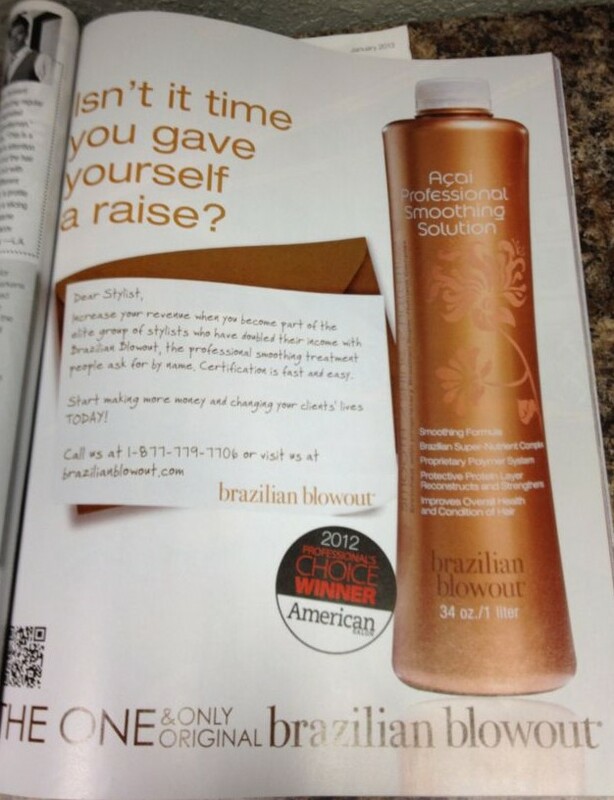 I am a (stylist/client/reader/concerned party) who is disappointed in your decision to include an advertisement for the Brazilian Blowout Acai Professional Smoothing Solution as a 2012 Professional Choice Winner in your January Issue. This toxic product has caused adverse and irreversible harm to many people. I would like for your magazine to educate its readers on the dangers of the Brazilian Blowout and other toxic hair straightening treatments. I hope to see responsible action being taken on your part by addressing this serious health concern in a future issue. Thank you for joining us in the fight to protect salon workers and their clients! This entry was posted in Blog and tagged American Salon Magazine, Brazilian Blowout, danger, dawn marino, industry, jennifer arce, salon, toxic, treatment, Women's Voices for the Earth by prettytoxic. Bookmark the permalink. Thanks Jen for posting this! I sent 3 letters. FYI, I have received this magazine for years and since this issue has started, they have never once addressed it, neither has Launch Pad, Modern Salon or Behind the Chair. I had sent them letters asking why and never even received an answer. As I said and don’t like saying it, it’s about the almighty dollar! Money talks. I hope you (we) get some action from this. Thank you for sending those letters! It’s so frustrating that these industry publications have yet to address the issue of these toxic products. Jen and I are working diligently to create awareness. Thanks always for your continued support & efforts! You are very welcome! As I have told Jen, anything I can do to help out, just let me know! Thankyou for informing us of this appalling news. I am definately going to send them a piece of my mind. I can’t believe American Salon Magazine would be this irresponsible.